OXFORD, Miss. ­– Fifty years ago, the Research Institute of Pharmaceutical Sciences at the University of Mississippi School of Pharmacy was awarded a competitive contract from the government to grow marijuana that could be standardized for research. Interest in marijuana research had grown throughout the late ’60s, and the government wanted to study the effects of cannabis on the brain and the body. To do that, it needed a source of certifiable plant material that was responsibly grown and harvested. Coy Waller, who would later become the leading force of UM’s marijuana operation, was serving on a committee of the National Institute of Mental Health and recommended to the organization that a program be created to provide this standardized marijuana to the government. After an open competition among institutions around the country, UM won the first contract in spring 1968 to be the government’s provider of marijuana for research purposes. Later that summer, Ole Miss researchers grew the first crop of legal research marijuana in the country, beginning a research project that has lasted half a century. The university’s Marijuana Project is under the supervision of the National Institute on Drug Abuse. Its longevity is a result of decades of honing the operation through tough competition for the contract, for which UM competes every three to five years. 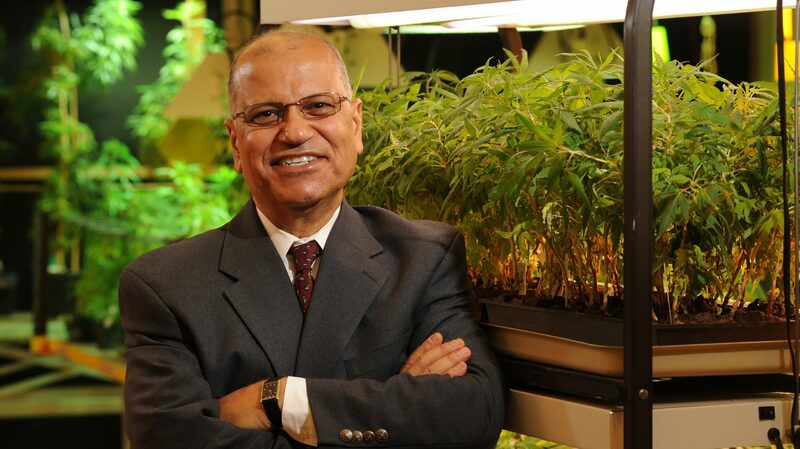 Since ElSohly joined the project as a postdoctoral fellow in 1975, the marijuana operation has expanded, security has increased and the project has been registered with the FDA as a drug manufacturer, meaning that everything they do must comply with the FDA’s Good Manufacturing Practices. The Marijuana Project is part of the National Center for Natural Products Research, which is housed within the School of Pharmacy. Ikhlas Khan, NCNPR director, has been closely involved with the project over the years. “We are very proud of our contribution towards the science and understanding of cannabis chemistry, pharmacology and product development over last 50 years,” Khan said. Indeed, NCNPR and the Marijuana Project both contribute to the university’s unique research profile. Since the university produces marijuana based on what researchers request from NIDA’s Drug Supply Program, it grows marijuana in a variety of chemical makeups. Recently, it has begun creating marijuana products for research, such as extracts rich in THC, marijuana’s psychoactive component, or cannabidiol, known as CBD. 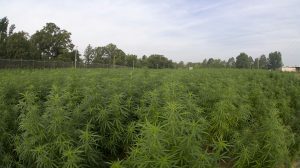 For the 2019 growing season, NIDA has exercised the option in its contract to grow marijuana in about half the university’s marijuana field, which consists of roughly 12 total acres of heavily secured land. For the past several years, the project was able to fulfill NIDA’s demand for smaller amounts of plant material by growing in its 1,100-square-foot indoor grow room. The exact amount to be grown is not yet finalized, said Suman Chandra, a co-director of the project. However, if the crop is planted based on the exercised option, it will be the largest amount of plant material NIDA has ever asked Ole Miss to grow in a single season. 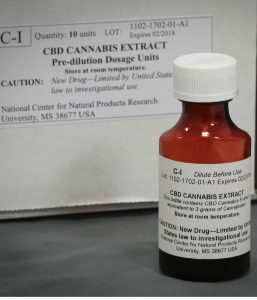 In fact, earlier this month, a clinical study on CBD’s impact on certain forms of juvenile epilepsy began at the University of Mississippi Medical Center, using standardized CBD extract produced on the Oxford campus. UM is also conducting research on new pharmaceutical dosage forms that contain CBD, THC and other cannabinoids that will allow the therapeutic properties of marijuana to work while eliminating the psychoactive component. Although ElSohly is familiar with some of marijuana’s potential therapeutic benefits, he has also seen how the drug can be misused. Through a potency-monitoring project, the lab has analyzed marijuana samples seized by law enforcement since the early days of the contract and has seen marijuana’s potency increase dramatically. This trend also aligns with an increase in the ratio of THC to CBD in seized marijuana. In the 1980s and early ’90s, most seized material had about 10 to 15 times more THC than CBD, ElSohly said. But in 2017, that ratio had jumped to 100 times. “This is parallel to the increase in emergency room admissions of people experiencing psychosis, irritability and paranoia as a result of using cannabis,” he said. Although many states have legalized some uses of marijuana, the federal government still considers it to be a Schedule I drug, meaning it is illegal at the federal level to produce or possess. Because of this, UM remains the only place in the country that produces legal marijuana grown within federal requirements and standardized for research. The DEA announced in August 2016 that it would approve registrations for other qualified growers to produce and distribute marijuana for research purposes, but no additional registrations have yet been granted. After 50 years of operation, researchers in the Marijuana Project are still working to secure the next growing contract from the government when the current one expires. The project is in its fourth year of a five-year contract, and the university will be reapplying next year. For more information about marijuana research at UM, visit http://pharmacy.olemiss.edu/marijuana/.